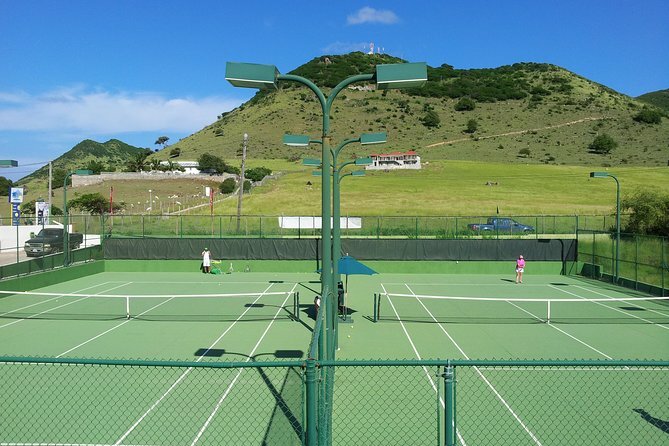 Rent a tennis court in St Martin and play singles or doubles! The day time tennis court rental is available at 4 different times throughout the day. The surface of the courts is made out of a porous concrete construction which is soft on the knees. Enjoy a tennis game with friends or family at the convenient tennis location at French Cul de Sac in between Grand Case and Orient Bay. The on-site amenities include a Pro Shop, snack bar, and lounge with dish network and free WiFi. Choose from one of 4 daytime rental times and enjoy playing tennis on your very own tennis court for 1 hour of singles or doubles play! Players will be greeted by Tennis Pro Oliver and given a short tour around the premises. Then you will be shown your court and informed about the rules of the Academy. You will then be free to use the tennis court for the amount of time reserved. The surface of the courts is made out of a porous concrete construction which is soft on the knees. A bell will be rung 5 minutes before the end of the hour signifying the end of the rental period. Rackets can be rented for a fee of 5 Euros per hour but feel free to bring your own equipment! Tennis balls can also be purchased at the Pro Shop along with snacks and drinks.